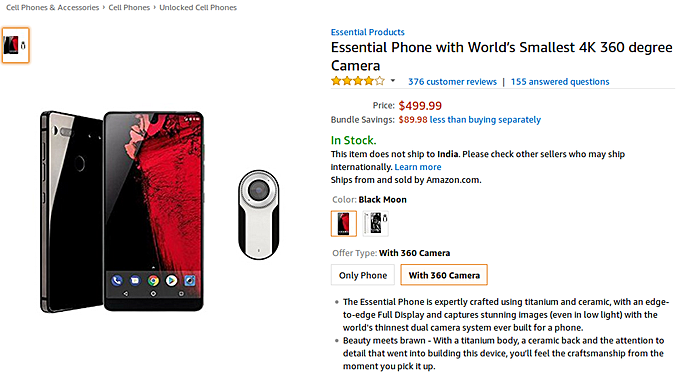 While the Essential Phone (PH-1) has already received some solid price cuts in the US, if you are planning to purchase both the phone and the 360 Camera accessory, you might want to take a look at the deal Amazon is currently offering. The retailer is selling the bundle for just $500. That's a saving of around $100 given that separately, the phone costs $450, while the accessory is currently going for $140. No information on when the promo ends, so those interested in availing it may have to act fast. Phone and 360 camera were $399 for Black friday/Cyber monday. Wouldn't consider any price higher than that. Apart from the gripes regarding the Essential PH-1, the bundle per se is quite worth it.